Family caregivers will tell you that caring for their parent with Alzheimer’s is like a time capsule in reverse. Suddenly their mom or dad is the child, and they are the parent, in more ways than one. Alzheimer’s patients have cognitive issues from moderate to severe. Memory for them can be non-existent. They may not remember how to tie their shoes, be able to figure out how to make coffee, or even know their name on any given day. So why would asking them to tell you a story be beneficial? Let’s start with the fact that like a child, they may have few memories, but still have a powerful imagination. Asking an Alzheimer’s patient to remember almost anything can be extremely stressful and cause them to shut down. Communication is difficult already, so as a family caregiver, you want to improve communication, not hinder it. Having a senior tell you a story using their imagination instead of being forced to use their memory is a low stress way to engage with them. This technique can be employed one on one at home. It can benefit all Alzheimer’s patients. Show them a photo or drawing and provide some simple start off questions. Who are these people? Where are they? Do they look happy? Now let them use their imaginations to tell a story about the photo. Repeat what they say so they will stay on track. Storytelling sessions help to improve the bonds between the patient and both family and professional caregivers. Everyone benefits.Even young members of the family get to experience a fun side of their grandparents. Contact C-Care Health Services for professional assistance if you are caring for a loved one with dementia or Alzheimer’s. 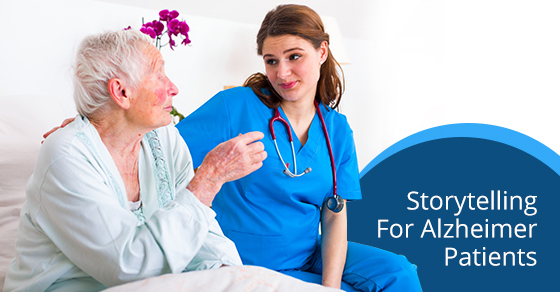 We can provide additional services if they reside in a care facility. Alzheimer’s care in Toronto is a phone call away.